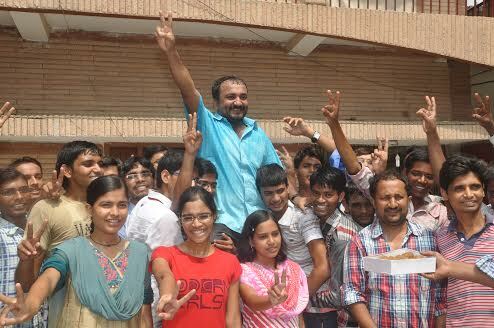 PATNA: Renowned Bihar mathematician Anand Kumar has earned worldwide acclaims for transforming the life of hundreds of poor and unprivileged children through his innovative free coaching institute, “Super-30”. In the past 16 years since it came into being, this free coaching institute which was included in the Best of Asia-2010 by Time magazine and listed as one of the world’s four innovative schools by Newsweek, has helped around 500 unprivileged children fulfill their long-cherished dream of cracking the prestigious Indian Institute of Technology (IIT) entrance examination. Now, comes a biopic drama film on the life of the mathematician and his educational programme. The film being directed by Vikas Bahl features Hrithik Roshan and Mrunal Thakur. Kumar set up the coaching institute in 2002 after his own dream of studying in Cambridge University in Britain crashed through midway due to severe financial crisis in the family. It’s for the kind of his devotion and dedication for the marginalized sections of the society that has earned him huge recognition globally. Super 30, a highly ambitious and innovative education programme, runs under the banner of the Ramanujan School of mathematics. It hunts for 30 meritorious talents from among economically backward sections of the society and shapes them for India’s prestigious institution—IITs. Only the selection of students for “Super 30” is said to be the key to the success in the highly competitive IIT-JEE exams such has been the reputation of this institute. In an exclusive interview with TheBiharPost, Kumar gave certain tips to the students seeking success in life but asserted there was obviously no “short-cut route” for success.